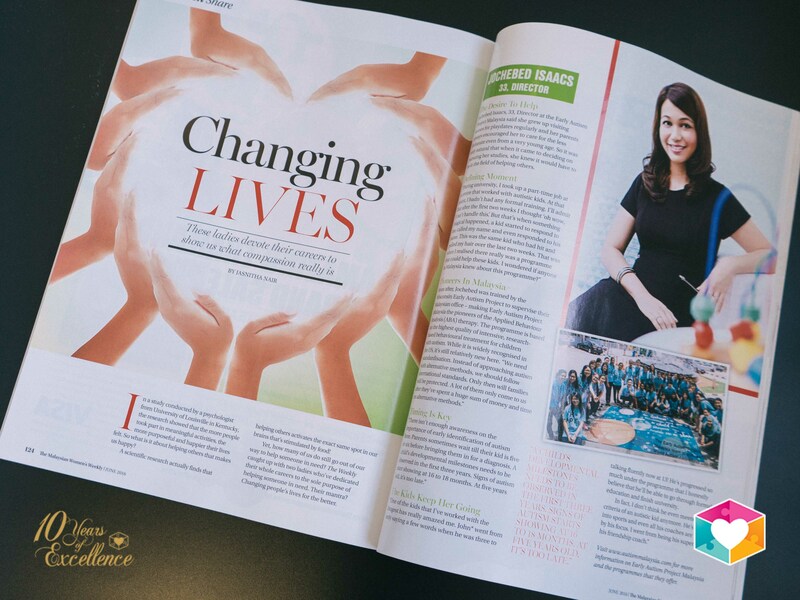 In the June edition of The Malaysian Women’s Weekly, our director, Jochebed Isaacs was featured in the Women Share segment called “Changing Lives”. In a study conducted by a psychologist from University of Louisville in Kentucky, the research showed that the more people took part in meaningful activities, the more purposeful and happier their lives felt. So what is it about helping others that makes us happy? A scientific research actually finds that helping others activates the exact same spot in our brains that’s stimulated by food! Yet, how many of us do still go out of our way to help someone in need? The Weekly caught up with two ladies who’ve dedicated their whole careers to the sole purpose of helping someone in need. Their mantra? Changing people’s lives for the better. Jochebed Isaacs, 33, Director at the Early Autism Project Malaysia said she grew up visiting homes for playdates regularly and her parents always encouraged her to care for the less fortunate even from a very young age. So it was only natural that when it came to deciding on pursuing her studies, she knew it would have to be in the field of helping others. “One of the kids that I’ve worked with the longest had really amazed me. John* went from only saying a few words when he was three to talking fluently now at 13! He’s progressed so much under the programme that I honestly believe that he’ll be able to go through formal education and finish university.